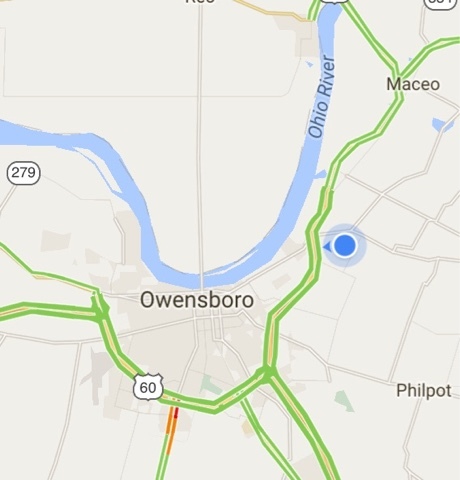 On Saturday, 4/16/16 - (Day 104) on my way to overnight in Evansville, IN, taking my time following the old US highways, I decided to go to Yellow Creek Park just east of Owensboro, KY to play disc golf. 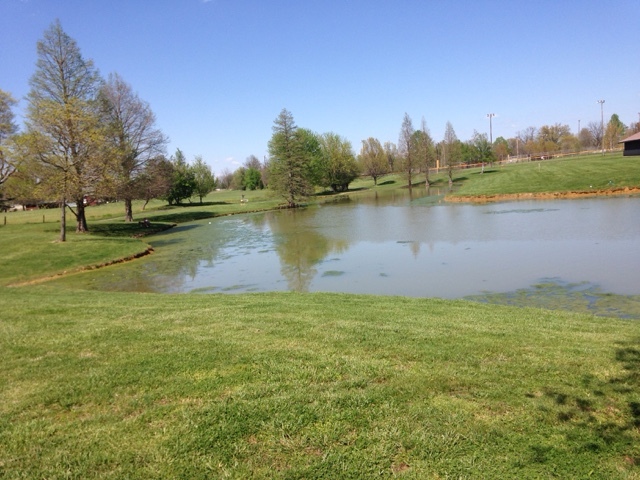 It is a well maintained park with the first 9 holes in woods and a couple fields. 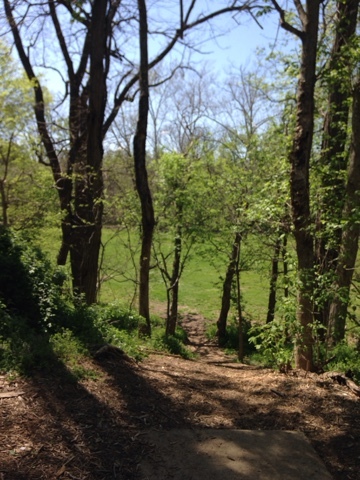 The wooded areas were not tight to play. On the first hole my drive set me up for 2 on a par 3 hole but I needed a 50 foot out. 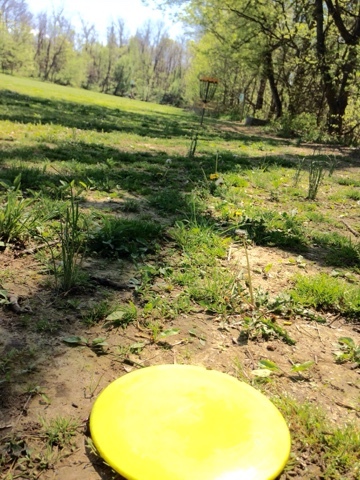 Here is my disc and if you look close you can see the basket. I made the put that put a smile on my face. When arrived there was a line to tee off on the first hole. I made me a sansmdwich and the backlog was gone. Here is one of the tight drives. 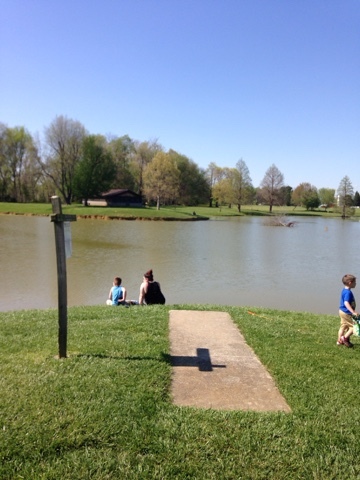 The 2nd nine holes were around a small pond. This drastically increases the difficulty for playing and the chances of loosing a disc in the alge bordered pond. I got to the 18rh hole and couldn't play it or should I say I didn't want tin play it. 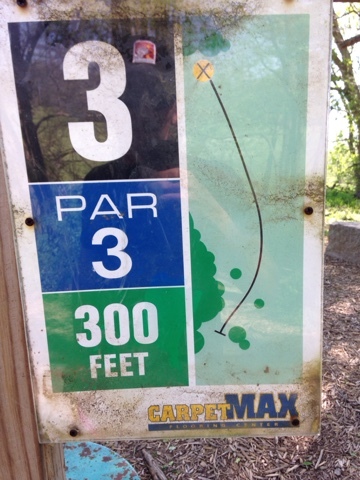 I threw one 290 foot drive today but typically I throw around 200 ft drives, so although I could possibly make the drive across the water probability has it that I couldn't make it. Here is the throw. A group of 4 played this hole before me and they had to work arounnd this woman and child sitting at the end of the tee box. 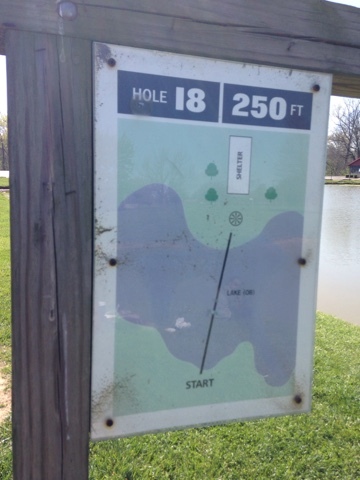 I decided to play another hole twice to get 18 holes in. Although I have improved my game each Travels I know my limitations and unfortunately my game isn't a long one.